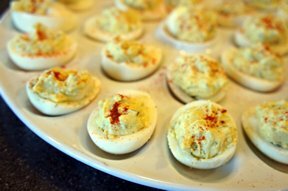 This recipe is inspired by classic deviled eggs plus a spiced version. It is my combination of delicious deviled eggs that conquered the hearts of my family members. Hard boil the eggs; then take out the egg yolks and mash them. Add the shrimps (small, boiled in salt water), yellow mustard, and mayonnaise. Mix everything very well; add pepper and salt. Fill the egg whites with the yolk mixture. Your delicious deviled eggs are ready. Decorate with basil and put in the fridge. 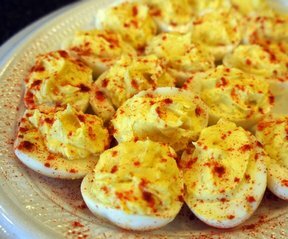 You can try these deviled eggs with Dijon mustard, I had yellow mustard at the time when I invented these and they were just fine. Tip: Deviled eggs should be served cold. So after preparing, put them in the fridge for an hour or two. 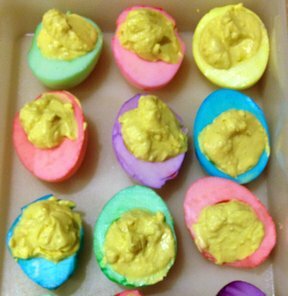 The deviled eggs should be eaten within 24 hours.